New tool on the farm. Last winter, we had a wicked ice storm. 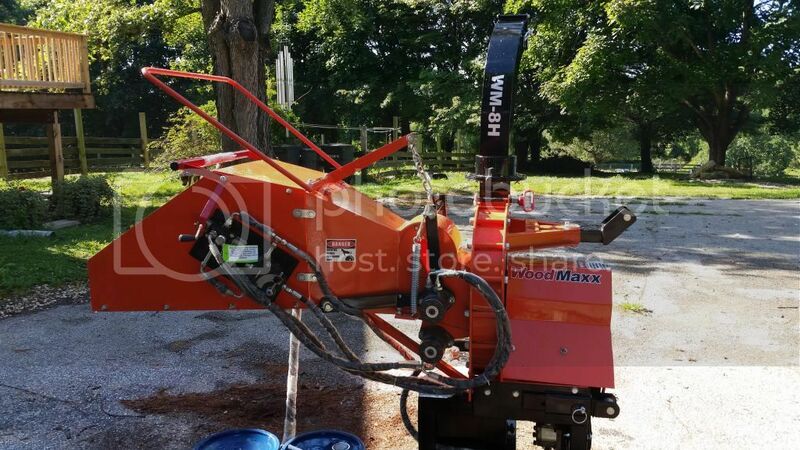 To clean up all the trees and branches, we spent nearly $2000 in chipper rental costs. This spring, we had a "severe wind event" (the powers that be refused to use the word tornado even though we had over 1/2 dozen trees broken off 20 feet up (where the trees were still 30 inches in diameter). I refused to toss another $2000 at this problem AGAIN, so I started looking into PTO driven chippers. 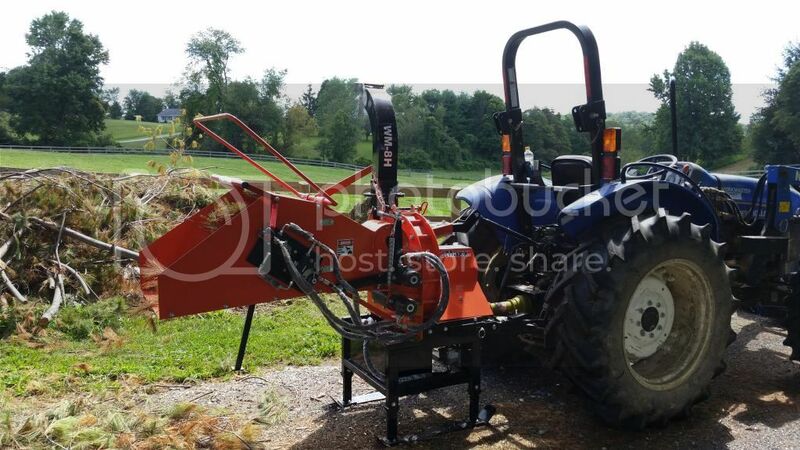 I ended up buying a Woodmaxx 8inch chipper with hydraulic feed. At $2700, it will pay for itself after the next significant storm. The chipper easily fed everything under 6 inches. 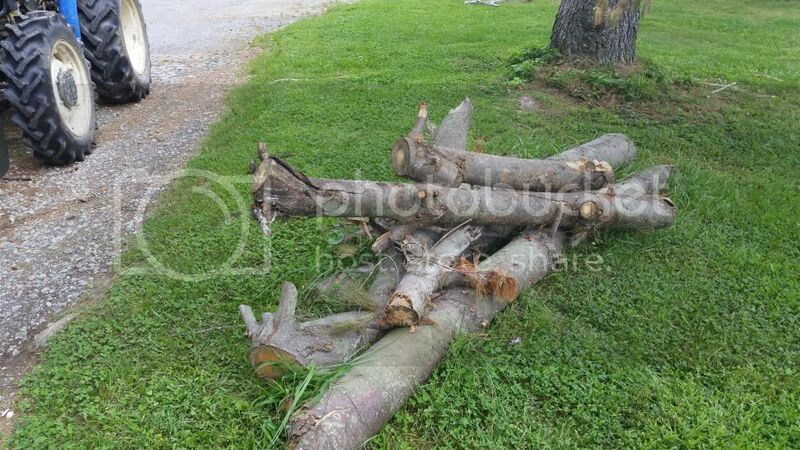 Between 6 and 8 inches, the branches/trunks have to be pretty straight and have limited side branches (nothing big). It's more a matter of feeding, rather than overwhelming the chipper. We are extrremely pleased with it. The only jams have been side branches poking out the slot where the feed roller rides. Both times easily fixed by lifting the roller and pushing it back out into the chute. Re: New tool on the farm. That's a neat tool, and good preparation. I wonder why the loca authority don't admit the tornado, just to relieve themselves from slow response and responsibility? But wouldn't that usually just made things worst in a long run, when there's hard evidence everywhere? What do you use the chipped wood for? Fuel? Nice chipper. Just don't stick your hand too far in. I think they'd have to call it a natural disaster then and pay damages. My question as well. What do you do with all the chips? Sent from my mind to your mind through the sorcery of language. If you're not always prepared, you're sometimes prepared. Nothing dramatic. We'll spread them under the fencing to keep the weeds down. 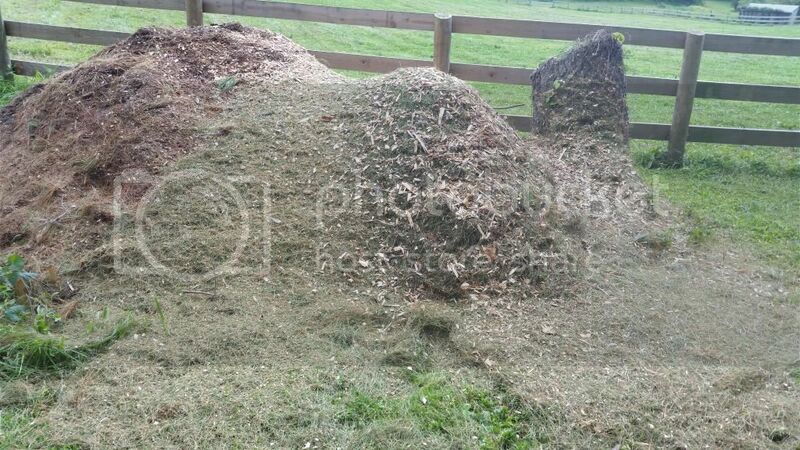 Those wood chips would be good for mulching, compost and fuel. I went to a school reunion some years back, met my old school chum who I haven't seen in 25yrs. Held out my hand and he held out his.......well part of it!! One thumb (more of a stump) and the only other digit was another little stump where his little finger had once been. Turns out he went into forestry soon after leaving school and was put straight onto the chipping. A week in, his jacket arm got caught and his hand was pulled in towards the teeth, screams alerted nearby colleagues who quickly rushed over and shut the machine down ...but not before the chipper had gotten to his fingers. Seriously , them machines scare the hell out of me. Very clever and very efficient...but jeez! Reminds me of a local farmer who was pulled into a baling machine years ago. He lived by carrying his severed leg into the next field and raising the alarm. Although I marvel at all the big farm machinery, they do demand respect. Baler almost took my fingers off last year, I lost some skin off my knuckles but yeah it was way too close. Machinery is one thing, I've seen a few guys get wasted by young horses though and that wasn't pretty either. My Uncle Bob has one stub for a finger when he needed to push a bit of stuck hay into the baler. That was in the late 1960s. I watched a guy get BBQed in my barnyard when he ran a boom on a grain truck into the power lines. Another guy I know has three of his fingers missing because of the watch he was wearing while he was running a grinder. And one of my friends was killed when his tractor rolled and crushed him. To hell with that, I put the saw away and went off to play with friends. Funny thing is I stumbled across that saw again last year in dads out building for the first time in 34 years, my blood ran cold just looking at it.